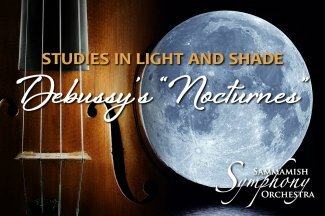 Join the Sammamish Symphony for a concert showcasing the music of Claude Debussy including Danses sacrée et profane with harpist Bethany Man, The Martyrdom of Saint Sebastian: Two Fanfares, and Nocturnes. The program also includes works by Mozart, Schubert, and Gilbert and Sullivan. With special guest soprano Anjulie Djearam, the symphony's 2018 Youth Concerto Competition winner. Visit SammamishSymphony.org for tickets and more information.